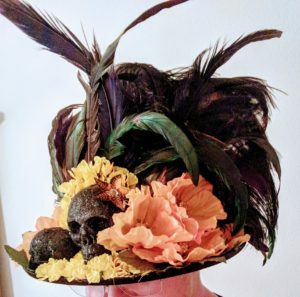 A cubmaster wears many hats, you know, so I’m taking that literally this year! 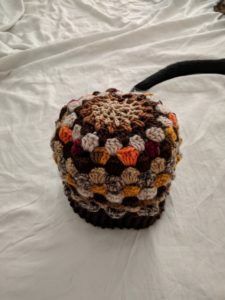 I’ll take more pics as I finish each piece for the giant November hat and show how I put it together in another post. I learned how to do the eyelet foundation/stitch, which is a lot easier than it looks. Elizabeth White is something else. 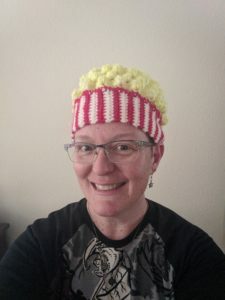 Check out the stuff she comes up with at Bella Crochet. 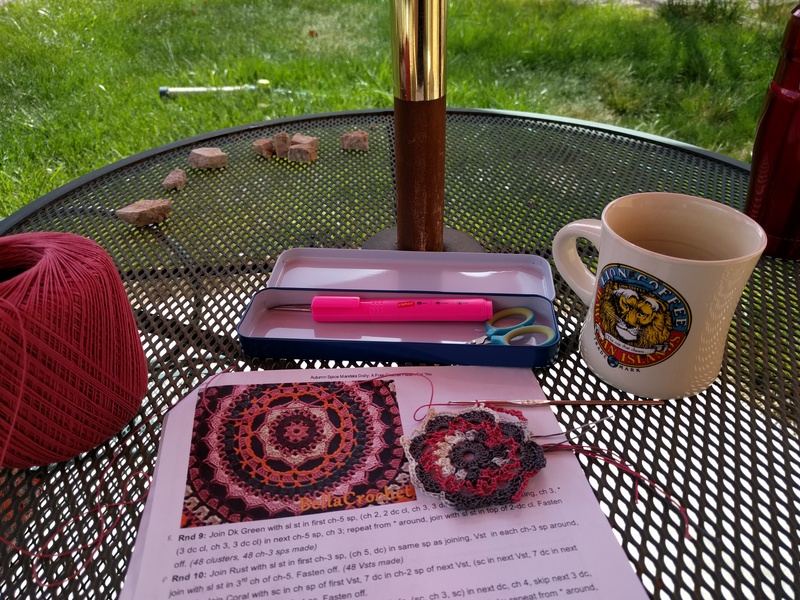 Two more days and I’ll be home with the kiddos and outside in this chair as often as possible, reading and crafting and being me. It’s pretty early, I can’t think of a better, more clever title. Literal always works well, right? I have been looking, (lazily I admit), for this Dimensions kit for years. Like as long as I remember. Before college? Anyway, my brother likes the painter this is based on and I finally found this one on sale and snagged it. (I know that’s not a very exciting story, but it was pretty satisfactory when I finally found it on sale) I’m bored of and/or frustrated with everything else I’m working on, so I started this one yesterday when Penny and Mike came over for a visit. That’s prime crafting time for me, because I get double the help with kiddo stuff. 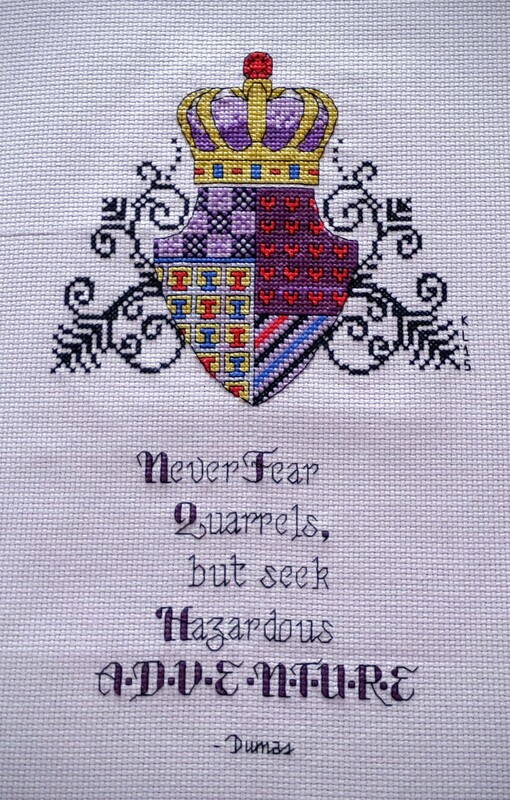 I should mention I’ve never done a stamped cross stitch before. 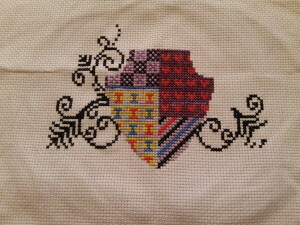 Turns out it is easier than I thought it would be, and quite a bit quicker, since I don’t have to count every little stitch. Which is pretty nice because I’m super tired of the big x stitch I’m also working on. More on that later. Counting is hard. This is Dimensions Kit #2330, “Snooze”. It comes with everything you need, two needles, thread (conveniently organized! woot! 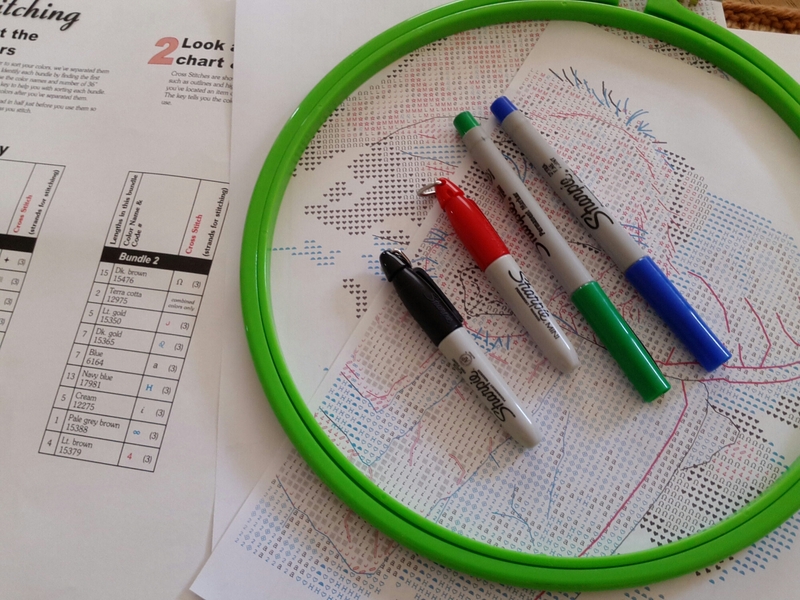 ), chart, directions, and fabric. I’m using a hoop for this to keep the stitches even. It’s from Loops and Threads and I’m really impressed with it. It’s easy peasy to adjust and it feels good to hold it; it’s just a comfy hoop. Awesome! I didn’t take a picture of everything in the bag before I opened it. I’ll let you use your imagination. 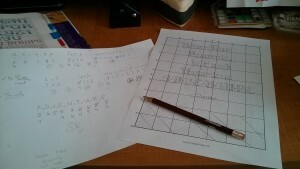 First things, first, I always make a color copy of the pattern on as many pages as needed. This one is only two copied pages. This prevents me from damaging or losing the original pattern. I only lost one pattern, but it was devastating lemme tell you. Good news is that Dimensions will happily replace any patterns, or even extra thread if you run out. I like keeping a copy to mark up and highlight. Speaking of marking up, yay sharpies! 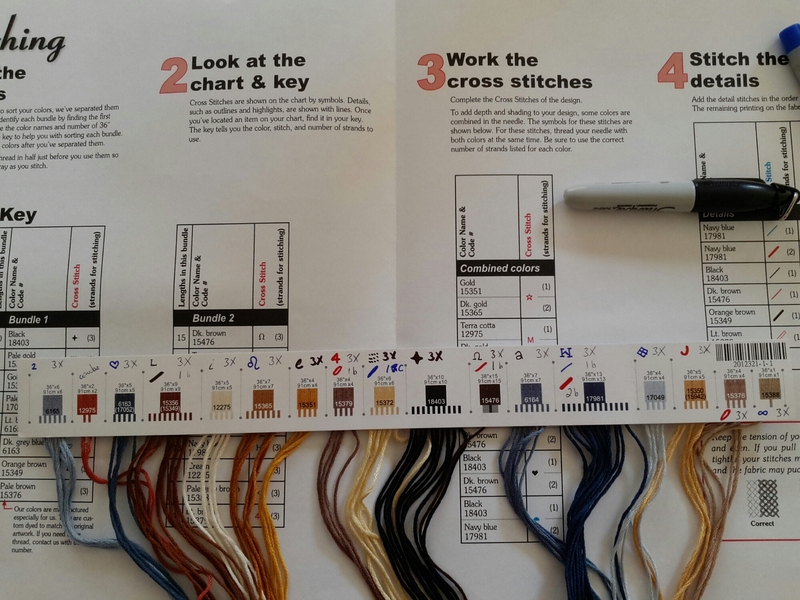 I mark the color-coded symbols right onto the thread organizer to make it easier to change thread while stitching. 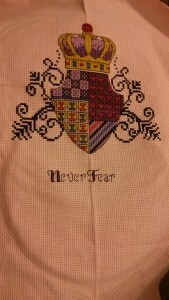 I mark the symbol, the stitch needed, and the number of threads required. 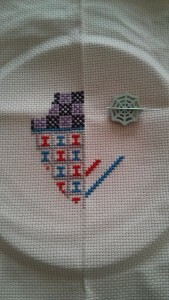 For example:  3x = symbol for black thread, three strands, cross stitch. In this kit I abbreviated couching as “c” and backstitching as “b”. It’s not rocket science, but it’s fun to draw and label things. :-) I think organizing and preparing the kit is part of the fun! Some kits don’t come pre-organized like this, and I use the included thread card or my own index cards to organize loose threads. Like combined colors! 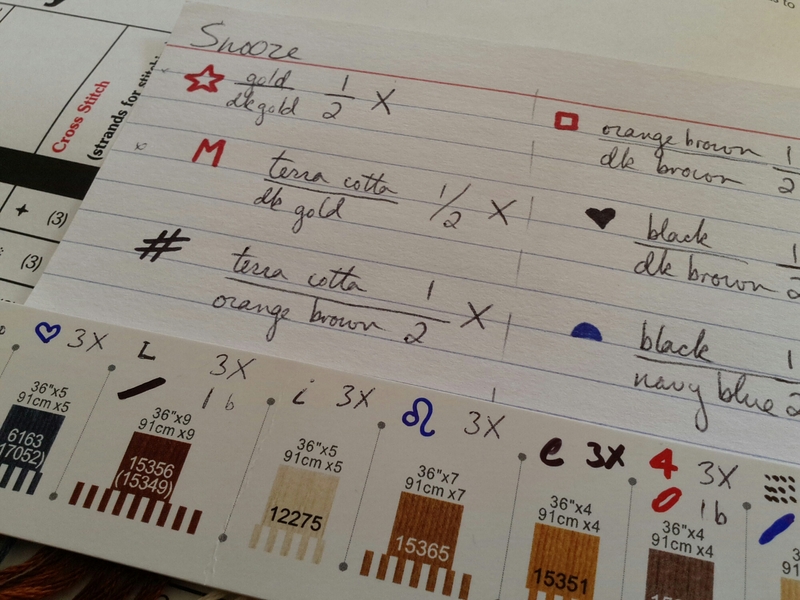 This kit uses combined colors, so I use an index card for those. You have to combine them yourself, which I do as needed in the project because it takes awhile and I’m too excited about starting as soon as possible. I write the symbol, and the ratio of colors next to it. 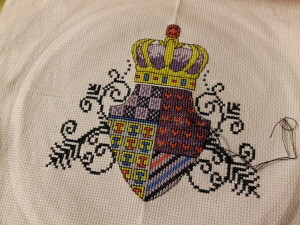 The names of the colors along with the number of strands needed, and the stitch required. 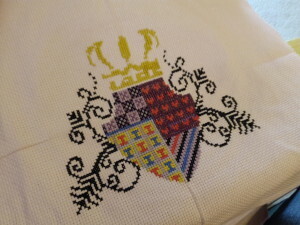 So the top left combined color would read: red star = 1 strand gold+2 strands dark gold as a cross stitch. I punched holes in the card next to the color to hold the thread (I forgot to do that before I took the picture-use your imagination). I know it looks like a lot of work, but it took me less than 10 minutes, since the thread was already organized for me. 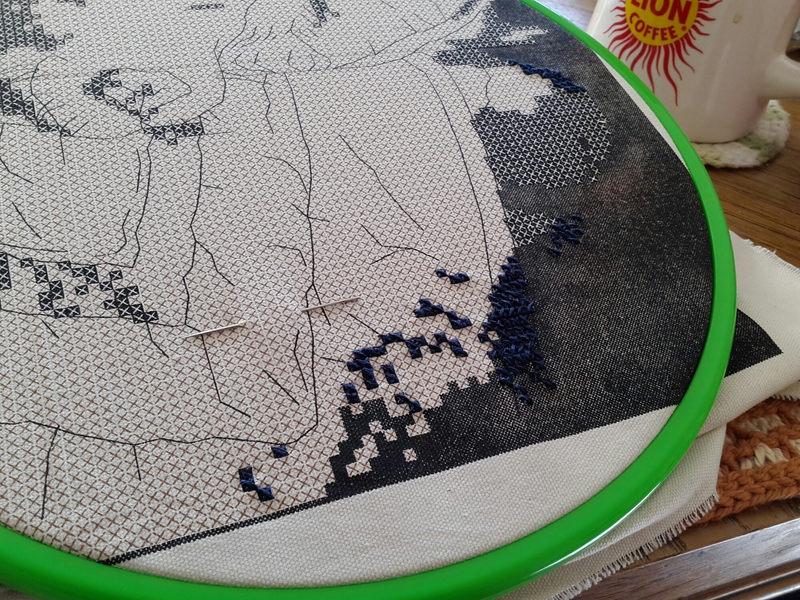 This method is really helpful when the thread just comes in bundles and you have to separate the colors one by one. Oh, I said something about another project, didn’t I? 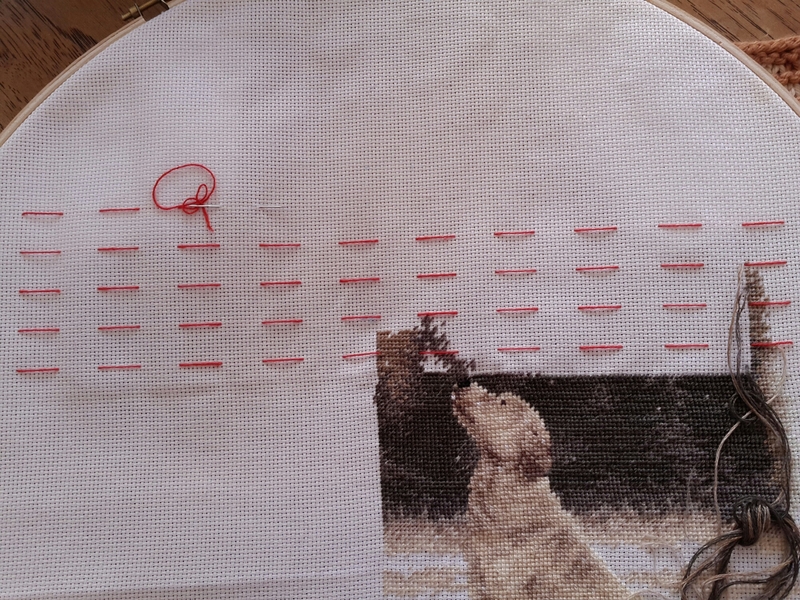 I was having trouble keeping track of those half stitches in Man’s Best Friend, and learned about graphing out the 10×10 blocks used in the pattern. I had some leftover red thread, so I counted out the blocks. 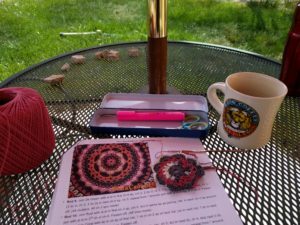 When I’m done stitching I’ll simply pull out the red thread. It took me 3-4 times to get the stupid blocks right, and exactly 10×10! ack! But this should help a lot in keeping track of where I’ve been. Sometimes just counting is not the easiest way. 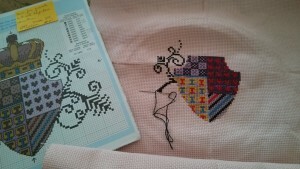 I decided to stop fighting myself over it and do the grid. It certainly looks less daunting now. One more thing! 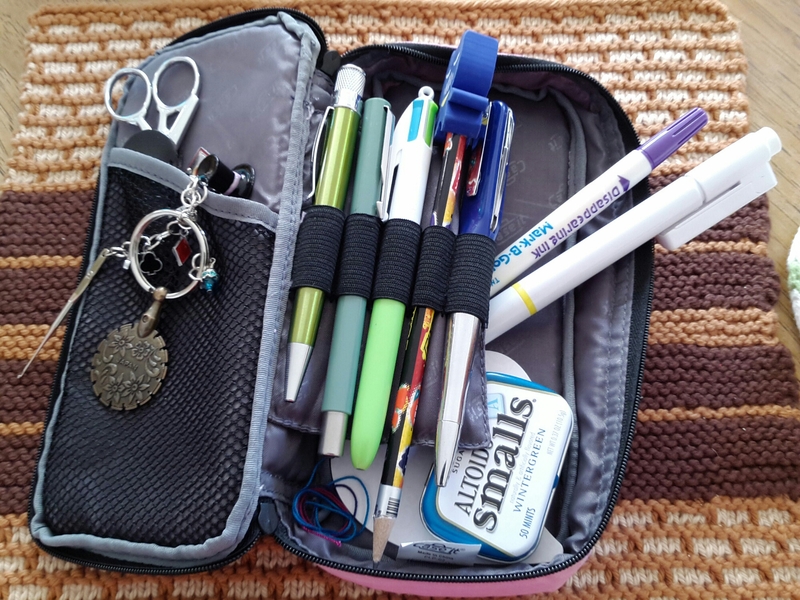 I found a pouch when I cleaned part of my room, and I put all my favorite pens in there, plus all my embroidery and tatting needs, so I won’t (hopefully) lose anything I need for a project again. Like misplacing the nice scissors, or wondering where my good highlighter went. Office supply stores always have a bunch of different pencil cases on sale in September. I can never have enough of them. Okay then. 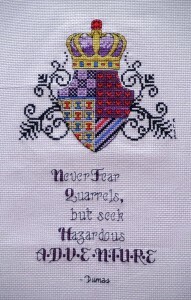 Off to stitch some more. Happy stitching!